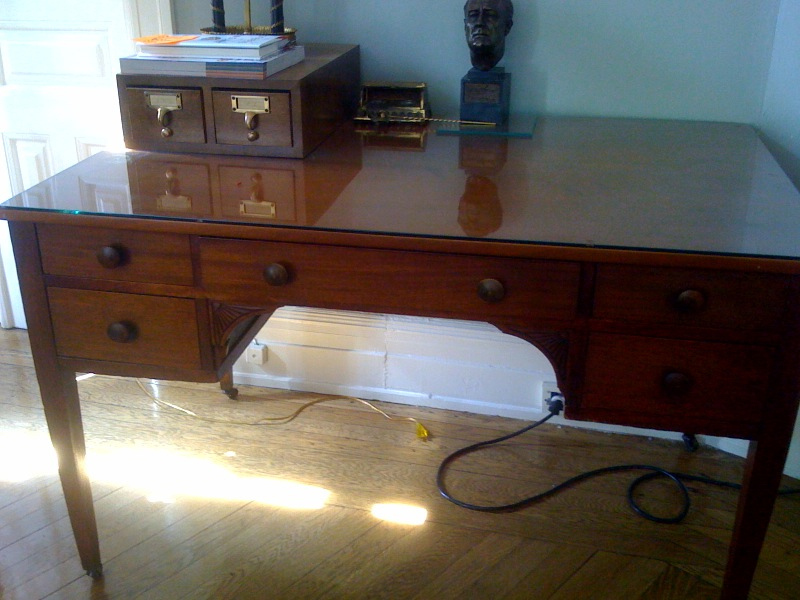 Frances Perkins's desk at the Woman's National Democratic Club. However, I had the opportunity to see the original official portrait of Secretary Perkins, which is currently hung in Secretary Solis’s outer office. I think the desk in the portrait looks a lot like the desk at the WNDC. Take a look at this rather dark photo of the portrait. What do you think? Same desk? Come view the desk at our party on April 21st and see for yourself! It’s really great to hear such enthusiasm emanating from the halls of the Frances Perkins building! Here’s a link to a webcast of the swearing in: http://www.dol.gov/dol/media/webcast/main.htm. Finally! The vote in the Senate was 80 – 17 late yesterday. It will be interesting to see what influence the long-awaited labor secretary wields in President Obama’s cabinet. Hilda Solis has been compared to Frances Perkins, who played a huge part in the New Deal. With Solis’s pro-worker perspective, an influential role for her would mean good news for American working families. Solis vote today at 2:00? Many observers have compared Solis with the first woman who ever served in a U.S. 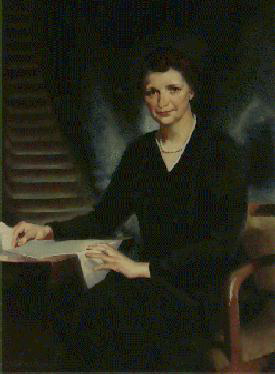 Cabinet, Frances Perkins, the liberal Labor Secretary in Franklin Roosevelt’s administration. Perkins is often credited with having pushed FDR to the left on many issues. There’s some concern that an anonymous Republican senator could still put a hold on Solis’s nomination. Or that the Republicans could filibuster it. But in reality, both of these tactics are dead ends — the Obama administration favors passing the Employee Free Choice Act and ANYONE they nominate will also support it. At some point, the anti-unionists will have to admit defeat. NOTE: The Frances Perkins Center is waiting to finalize a date for an event at the Department of Labor honoring Secretary Perkins’s contributions to workers’ lives until the Senate confirms a new secretary of labor. We’re hopeful about that 2:00 PM vote! Obama has made clear that his Labor Department won’t be anything like the one under Bush. “Remember, this is supposed to be the Department of Labor, not the Department of Management,” he has stated. Elaine Chao — Bush’s Secretary of Labor who was confirmed in just 18 days — made it through all eight years of the Bush administration, causing such a drop in morale at the Labor Department that staffers threw a “good-riddance party” to cheer her departure. She left behind a “deeply troubled department” that “spent eight years attacking workers’ rights, strong workplace health and safety rules, and unions while they carried the water for Big Business.” Chao, of course, was also a stalwart opponent of the Employee Free Choice Act. Under Solis, the Department of Labor will once again defend the rights of workers. As a state senator, Solis authored the first environmental justice law in the nation, and she has since said she is committed to creating green jobs. She also told the Senate that she would address the retirement security crisis; ensure that workplaces are safe, healthy, and fair; and protect workers from job discrimination. Is there a “hold” on Hilda Solis? The Health, Education, Labor, and Pensions (HELP) Committee has not yet voted to send Congresswoman Hilda Solis’s nomination as Obama’s labor secretary to the floor. The nomination was announced on December 19th, and since then, a number of other cabinet positions have been voted on. 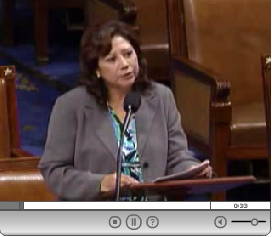 So what’s the hold up with Secretary-designate Solis? A “hold” is when a senator on the committee anonymously “blackballs” a nominee, which effectively stops the nomination process in its tracks. Technically, a hold can’t be placed until after a nominee is voted out of committee, and Solis hasn’t even gotten that far. But some are speculating that a hold has been threatened by Republicans who don’t like Solis’s strong endorsement of the Employee Free Choice Act (EFCA). But here’s the problem for the Republicans on the HELP committee: President Obama is also a strong supporter of EFCA. And he’s not going to nominate a secretary of labor who isn’t. The GOP needs to understand that Barack Obama voted for the Employee Free Choice Act (which the Chamber of Commerce calls “card check” instead of “Majority Sign-Up”) and his Labor Secretary-designate, Hilda Solis, co-sponsored EFCA in the House. The GOP needs to face facts: this new Administration favors EFCA. A delay in confirming the Labor Secretary doesn’t, and won’t, change that. Like Frances Perkins, Hilda Solis is also a very passionate, serious, and courageous leader and also happens to be the most progressive appointee in the cabinet of the new administration. She has deep ties to organized labor, the immigrant community, and movements for environmental justice. With the right amount of grassroots support and pressure, Solis could make a serious contribution to the formulation of progressive legislation that would greatly impact and improve the daily lives of the majority of Americans long into the future. The financial crisis the Obama administration has inherited is the greatest of our time. It presents the same opportunities that were there in 1933 when Frances Perkins and FDR took over the White House and created the modern welfare state, bringing the US out of the Great Depression and into the 20th century socially and economically. Let’s hope the HELP Committee and the full Senate move quickly to approve Solis’s nomination. Hilda Solis to be next Secretary of Labor? Two Bloomberg reporters, Kim Chipman and Julianna Goldman, are reporting that President-Elect Obama’s pick for Labor Secretary is Representative Hilda Solis. Solis, 51, is a four-term member of Congress with an extensive record on environmental issues. Her legislative accomplishments include spearheading a bill to provide workers with training for “green-collar” employment. Such initiatives are a hallmark of Obama’s plan to address the country’s energy needs and create new jobs. Obama has promised to press an ambitious labor agenda to strengthen unions, protect jobs and bolster the middle class. The president-elect is set to announce the Solis appointment tomorrow in Chicago, said the officials, who spoke on condition of anonymity. Solis, who grew up in a union household in Los Angeles County, is a favorite of labor groups, including the Service Employees International Union.